SAN DIEGO, CA--(Marketwire - January 20, 2011) - Navigating the digital landscape and creating a social media strategy for business is a challenge. In an age of instant communication, it is no longer possible to have sole control over the message. Social media is changing the way businesses interact and shaping the way business is done. Often viewed as a daunting addition to the marketing mix, there are very simple and comprehensive ways to exploit digital platforms to enhance marketing strategies and build customer relationships. With minimal spend and tangible return on investment, there is a clear commercial impetus for social media marketing. Twitter, until recently a social media platform ostensibly free of advertising, reportedly made $3.5m for Dell in less than six months. Dell's Twitter feed features daily product offers, which 'followers' can take advantage of and, crucially, share. In doing so, the Twitter page not only drives traffic to the website and footfall in-store, but creates a loyal group of users who become the advocates of the brand. This can be much more valuable than traditional direct mail or advertising. Business Review Europe is a leading digital media source of news and content for C-level executives focused on business and industry-specific news throughout Europe. 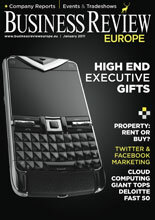 Business Review Europe is the territory-dedicated arm of the White Digital Media Group. Founded in 2007 by entrepreneur Glen White, White Digital Media retains a diversified portfolio of websites, magazines, daily news feeds and weekly e-newsletters that leverage technology to innovatively deliver high-quality content, analytical data, and industry news. Business Review Europe is headquartered in Norwich, UK. For more information, contact 44 (0)1603 217530 or visit http://businessrevieweurope.eu/.